The Cape Town episode. It’s much more than just a collection of whisky bottles – Patrick Leclezio checks out the bigger picture at the Bascule Bar. When I first heard about the Bascule it was with reference to its impressive assortment of whiskies – 400 odd back then, supposedly the largest of any bar in the Southern Hemisphere. Subsequently each mention of it, in the press in particular, fixated on this same angle; and whilst it’s admittedly worth the boast – what whisky lover wouldn’t be intrigued – it has also placed the bar in a bit of a one-dimensional pigeonhole: “Ah the Bascule, that’s the place with the large selection, right?”. Things have moved on since then. Firstly, any whisky bar worth its salt, and there are an increasing number available to us, should offer satisfyingly vigorous variety, and whilst the Bascule’s is now over 500 strong, there are others that come close to or even exceed it. Secondly, the Bascule is far more than the sum of its whisky parts; it would be a grossly missed opportunity (and an injustice) to remain ignorant of its wider charms. In this spirit I decided to dedicate an evening, some quality time, to get to know the place in-depth. The bar takes its name – in case you were wondering – from the nearby bascule bridge (a type of moveable bridge that employs counterweights to open and close, hence giving access to naval traffic), the only one of its kind in the country. It, the bar not the bridge, is ensconced in the Cape Grace hotel, amongst the Cape’s finest and a recent recipient of high accolades (from the TripAdvisor website – second best hotel in the world in their 2013 Travelers’ Choice Awards). In a case of narrowly averted tragedy, a less travelled road (back then) almost not taken, the bar didn’t figure in the hotel’s original plans. It was an afterthought – its existence indebted to the then-owner’s passion for whisky. This may go some way to explain its position in the lower reaches of the structure. As inadvertent as this might have been it doesn’t suffer as a result of it; actually quite the contrary – the subterranean floor level, the tunnel-like passages, the restricted natural light, the ship-type staircase (a “ladder” in nautical speak), and the direct access to the quayside all combine to give the place a certain unique cachet. It’s cosy and intimate, elegant in a welcoming and comfortable manner, and, as I was to discover, infinitely interesting and engrossing. My host for the visit was Bascule manager George Novitskas. We sat down together – in the delightfully opulent high-backed chairs installed during the recent renovations – over craft draughts from the Cape Brewing Company (what better than some skilfully brewed barley to break-in the palate), a bottle of Highland Park 12YO (still in my opinion one of the most complete Scotch whiskies on the market), and a couple of mouth-wateringly delicious Wagyu burgers (the meat coming from cattle originating in Japan, and renowned for being the self-same source of the world famous Kobe beef) . This burger is the star attraction on a well-considered, elaborate, but mostly tapas-based menu, which is primarily intended as a snacking accompaniment for patrons. George is very particular on this point: the Bascule is a bar, not a restaurant…although those seeking more extensive fare can always order from the hotel’s main eatery. Inevitably, obligatorily, the whisky discussion began with the much lauded collection, which includes highlights such as the Glenfiddich 50YO, the Glenmorangie 1963, the Laphroaig 40YO, the Ardbeg 1975, the Glen Grant 1952, the Highland Park 30, and the Dalmore 1978 – enough to keep the more (most?) demanding connoisseurs well-satisfied – but this is only the beginning of the bar’s whisky attractions: whilst the classics and some winter warmers are already available, a bespoke whisky-specific cocktail menu is being created for the Bascule by one of the country’s top mixologists; customers can request to have their whisky served with a perfect ice-ball, made using a Taisin copper press, one of the few, if not the only one, in the country; and the bar also offers an extensive program of whisky tastings and a well-subscribed whisky club. It’s worth dwelling on these last two offerings. Whisky tastings are all the rage at the moment – for corporate functions, for bachelor parties, or just simply for one’s general enjoyment and enrichment. The Bascule provides two types of tastings. The first is a self-tutored ‘flight’ of whisky – basically three related whiskies presented on a tasting mat that is inscribed with relevant information. This strikes me as an ideal vehicle for musing over a couple of drams easily and on short-notice, whether in one’s own company or as a shared experience. The second is a tutored tasting – offered at three levels – the Introductory, the Intermediate and the Sommelier’s Choice – and conducted by one of the bar’s managers, each of whom, along with the rest of the staff, would have been trained on Dave Broom’s World Masterclass series. These tutored tasting also feature the growing and (very) agreeable trend of pairing food with whisky. The Bascule whisky club almost defies belief. Members enjoy the place as if they’re in their own homes – and effectively that’s the whole premise of the thing. One of the values of the Cape Grace hotel is to make visitors feel like they’re at home, and it has certainly succeeded with the club; for a nominal annual fee members are allocated a bottle locker which they can stock at much reduced prices. To the gregarious, whisky-loving gadabout, and I know a few, this is like the proverbial manna from heaven. Throw in six special, catered tasting events, an end-of-year members’ party, and the option to use the club for one personal function, and you’ve got a package that’s almost too good to be true. The Bascule also gives each member a crystal tumbler with their name engraved on it – a discreet, understated symbol of their special status. I may be under the influence of the Orkney peat buzz, the memory of that delectable marbled beef, or the lingering pleasure of an evening well spent, so dim my effusiveness down a notch if you will: the Bascule Bar is quite simply magnificent. The whisky community has embraced it, celebrities flock to it, and both locals and tourists are drawn to it persistently. 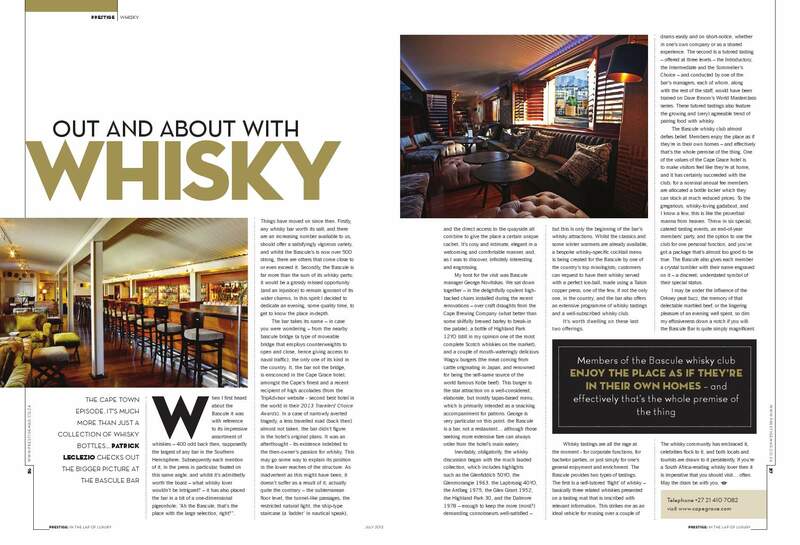 If you’re a South Africa-residing whisky lover then it is imperative that you should visit…often. May the dram be with you. This entry was posted in Whisky column and tagged Bascule, Cape Town, Whiskey, Whisky. Bookmark the permalink.